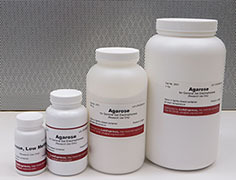 Agarose, For General Gel Electrophoresis: Cat No. 2001. Standard gelling/melting temperatrue, high gel strength, suitable for routine nucleic acid analysis and blotting. Agarose, For High Resolution of Small Fragments: Cat. No. 2002. Separation of DNA fragments smaller than 1,000 bp; molecular screening etc. Agarose, Low Melting: Cat. No. 2003. Low melting/gelling temperature, suitable for DNA/RNA recovery from the gel, tissue culture and viral plaque assays.